At Michael Kelly Dentistry, we offer a range of veneering solutions- single or multiple tooth bonding, porcelain or CEREC emax veneers. All the options you need to make the changes you desire. 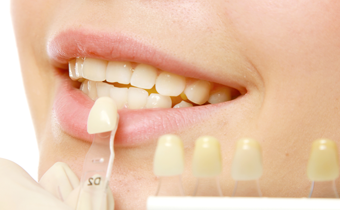 Porcelain veneers Glasgow are thin, fingernail-like pieces of porcelain that slip over the front of the tooth to change the colour and/or shape of the tooth to improve the smile. The teeth usually require a degree of preparation prior to fabrication and bonding of the veneers. The entire process is reasonably quick and straightforward and can give a fabulous result over two visits. Veneers can be used for a number of improvements in a smile, from repairing a cracked single tooth to straightening crooked, overlapping or spaced teeth. Discolouration and antibiotic staining, along with spaced twisted and chipped teeth are the most common problems corrected in this way. Emax is the strongest material available providing the optimum lifelike aesthetics for your veneers and this is what we prescribe for all of our cases. Delivering all the benefits of traditional porcelain or emax veneers but created using the eye and artistry of the dentist using mouldable composite material. Simple changes such as closing small gaps between teeth to improving the shape of malformed teeth- these an be delivered more quickly and with more flexibility whilst also cutting the laboratory cost usually involved with veneers. Bonding as few as one or up to eight front teeth can really make the most amazing difference.